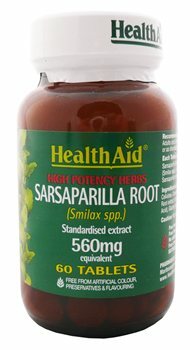 HealthAid Sarsaparilla tablets are formulated using the best quality root extract and are an excellent supplement for those wanting to cleanse and maintain a healthy skin and immune system. (Smilax spp.) 4:1 equivalent to 560mg of Sarsaparilla root powder. Bulking agent (di-Calcium Phosphate, Microcrystalline Cellulose, Crosslinked Sodium Carboxy Methyl Cellulose), Sarsaparilla Root extract, Anti-caking agent (veg Magnesium Stearate, Veg Stearic Acid), Glazing agent (polyvinylpyrrolidone). Adults and children over 12 years, one to two tablets daily or as directed by a qualified person. is this good for exema conditions ?